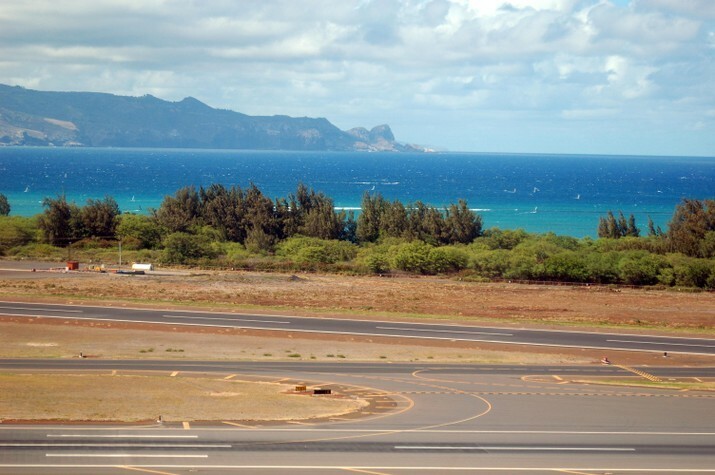 View of Maui’s northwest shore from one of Kahului Airport’s runway. The airport complies fully with Federal Aviation Administration (FAA) and Environmental Protection Agency (EPA) requirements regarding runway safety areas, fire safety, perimeter security, storm drainage and other matters. OGG has an oil spill prevention plan that meets EPA requirements. On March 4, 1996, the FAA announced that the noise exposure maps for Kahului Airport were in compliance with the Aviation Safety and Noise Abatement Act. The FAA approved the noise compatibility program for Kahului Airport effective August 30, 1996. OGG has had a successful bird hazard management program in effect since 1989 to reduce the presence of cattle egret from the open, grassy areas of the airfield where they feed on insects, mice and other small prey. For additional information on environmental issues, visit our Division Environmental Engineering webpage or contact the Airport Environmental Engineer at (808) 838-8001.